After probably having been the most discussed topic at E-world 2019, PPAs also make an appearance in the real energy world. EnBW has announced that it will develop some large PV parks in Germany as subsidy-free or as PPAs. In Brandenburg, the energy supplier wants to build a subsidy-free PV park with an installed capacity of 175 MW and generate 175 GWh of electricity annually (source: Montel). In Mecklenburg-Western Pomerania, the group will develop another PV park as a PPA – together with the project developer Energiekontor. The two companies intend to build the 85 MW power plant east of Rostock by the end of 2020. Subsequently, the electricity generated will initially be purchased by EnBW for 15 years at a fixed price and will not require any financial support under the EEG. Over 15 years, 1.3 TWh of electricity is to be supplied via the PPA. However, the two companies kept financial details confidential (source: Montel). Our white paper on market analysis, pricing and hedging strategies for PPAs contains important information on this topic. You can download it here free of charge. On 4th of February 2019, the transmission system operators published the first draft of the Network Development Plan 2030 (2019) (NEP). In this draft, the need for grid expansion in the German transmission grid is determined on the basis of various scenarios, in particular for 2030. The scenarios illustrate a range of possible developments and were approved last year by the Federal Network Agency in the so-called “scenario framework”. Until 4th of March 2019, the results of the first draft are now available for public consultation . The TSOs will incorporate the consultation remarks into the second draft, which is to be confirmed after further consultation and review by the Federal Network Agency at the end of 2019. B 2025, B 2030 and B 2035 – those are the scenarios specifically considered in the first draft from the “scenario framework”. 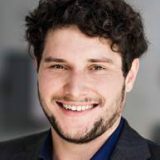 They are to be understood as the middle way of an increasingly flexible energy system transformation with the achievement of the renewable energy goals of the German government’s coalition agreement and the German climate goals. The results of the Coal Commission are to be incorporated in the second draft, but a strong decline in coal-fired power generation is already evident in the current draft. According to the NEP, the share of renewable energies in gross electricity consumption in the above-mentioned years is 59, 67 and 74 per cent, respectively. Thus, a strong expansion of wind and solar energy is expected. 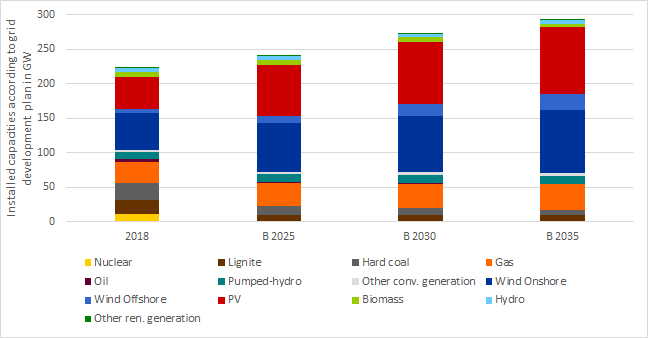 Figure 1 shows the capacities of various energy sources (without capacity reserve) in GW end 2018 as well as in the years 2025, 2030 and 2035 according to scenario B. 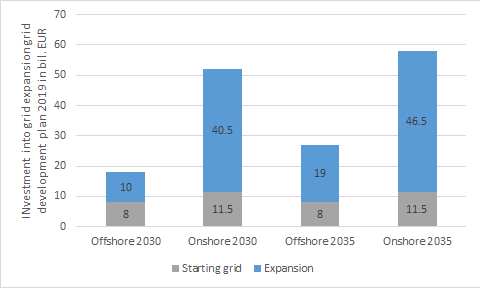 A doubling of PV capacities by 2030, as well as the strong increase in wind onshore and offshore over the course of time, is evident from the figure. According to the TSOs, the strong expansion of renewable energies, wind and PV, causes a strong generation gap between northern and southern Germany. The measures from the last NEP in 2017 are no longer sufficient to keep the grid in line with demand. Two additional DC transmission lines with 4GW by 2030 are therefore required in addition to the federal demand plan. The costs for the expansion of the onshore transmission grid will total EUR 52 billion by 2030 and EUR 58 billion by 2035. In addition, further offshore connection lines will be necessary, which will further increase the financing requirements. The estimated investment volume for the German offshore grid is EUR 18 billion by 2030 and EUR 27 billion by 2035. Figure 2 shows the costs for grid expansion in the transmission grid according to NEP 2019. The total investment (including the cost of the starting grids onshore and offshore with just under EUR 20 billion) will thus increase by around EUR 20 billion compared to the NEP 2017 to EUR 70 billion by 2030 and EUR 85 billion by 2035. 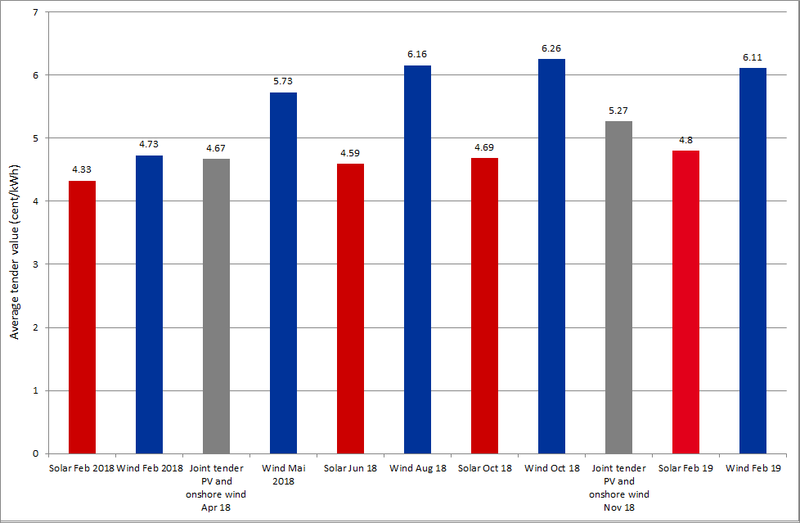 The results of the first tenders for PV and wind in the new year have been published. Compared to the last technology-specific tender in October 2018, the average tender values for PV increased by about 0.1 ct/kWh to 4.8 ct/kWh, according to The Federal Network Agency. The tender of February 2019 was two and a half times oversubscribed with 465 MW of bids, and 22 of the 24 projects awarded are located in Bavaria. Besides that, the surcharge values for wind energy also remained high. In detail, the surcharges ranged between 5.24 and the regulated maximum of 6.2 ct/kWh, while the average decreased slightly by 0.15 ct/kWh to 6.11 ct/kWh. In the wind tender, only 500 MW bids were submitted, while a total volume of 700 MW was available (source: PV Magazine). Figure 3 shows the results of the tenders since the beginning of 2018 and illustrates the stable level in the last tenders. The next tenders will take place on 1st of March (special tender for PV with 500 MW) and 1st of April (joint PV and wind onshore tender with 200 MW and biomass with 75 MW). Falling prices for CO2 (from 24 EUR/ton to less than 20 EUR/tonne) and coal (from 85 USD/ton to about 77 USD/ton) have also caused losses in the futures market for power. Among other things, certificate prices eased as the British auction freeze was prolonged, reflecting concerns that British positions might be sold as a result of a disorderly Brexit. Thus, the price for the baseload supply of electricity in Germany for 2020 fell by 3 EUR/MWh from the beginning of February to around 46-47 EUR/MWh. This price is about 5 EUR/MWh lower than at the end of January 2019, as Figure 4 shows. On the spot market, prices fell in the course of February due to warmer weather conditions and averaged at around 45 EUR/MWh. From Saturday 09th to Monday 11th of February 2019, the high wind input with peaks of more than 41 GW also led to some negative prices. Figure 5 shows electricity generation and day-ahead prices in Germany in February 2019.